Art galleries are similar to small businesses to a certain extent. In most cases, the gallery's purpose is to sell art and to keep the gallery in business. However, it is one business where the customer doesn't mind price increases. It is good news for an art collector, when the prices of an artist's work increase, as this signifies the artwork is becoming more valuable in the art market. Like with starting up any small business, you must know your market first. Many art gallery owners began first with a list of potential clients. Knowing a handful of people you can sell artwork to will help you get your business off the ground. As you develop good relationships with your collectors, they will then introduce you to their friends and associates and this will help to establish your art gallery. As word-of-mouth grows, so will your business. If your gallery is not a commercial one, but rather an experimental showcase, you will need to have alternative sources of funding such as art grants. Other skills include learning about artwork dimension. The art world wouldn't exist if it were not for artists. To open up a successful art gallery, you will need to begin with a strong roster of artists. Since art is highly subjective, a large part of your selection is based on personal taste and intuition. Some galleries chose their artists by location, theme, style or trend to name a few. For example, some galleries will only show landscape paintings or exhibit the artists who live in the same city. The possibilities are endless. However, the key to success is knowing that you have specific collectors (individual or corporate) you can sell the artwork to. Besides being knowledgeable in running a small business, it is imperative to also be passionate about the art. A lukewarm salesperson is hardly successful in sales. 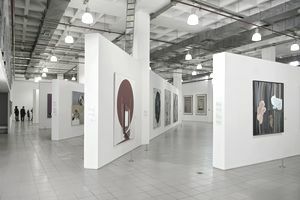 If you are just starting out, visit as many art galleries as you can and talk to the gallery directors and sales staff. Better yet, get a job in an art gallery first, to gain first-hand experience of how a gallery operates. As you acquire the necessary knowledge for running a successful gallery, you will then have the confidence to establish your own art gallery. As with any business, location is key. If your gallery is in a heavily-trafficked popular tourist area, you will have great opportunities to sell the work of the local artists. If your gallery is located in an art center, then you have more chances to gain the attention of the art world cognoscenti. Some gallery owners may even forego an actual site, and maintain a virtual gallery on the internet. Every business needs start-up money. Initial costs include the rental of the space, the necessary equipment for running a business and exhibiting art, hiring a staff, and other factors to consider include the monthly operating costs. The word used in the art world is 'schmooze' and means to network. Artists, critics, art dealers all need to make connections and broaden their art networks. Whenever one of your artists is in an exhibition, be sure to be standing near the artwork to provide more information and to arrange studio visits with those potential contacts. Maintaining good relationships with art critics who can write about your artists is also a good way to generate interest in your gallery. So be sure you can provide ample text and images to the critic or journalist. Running a gallery in most cases takes a period of time to establish, so being patient is key to building a steady business.